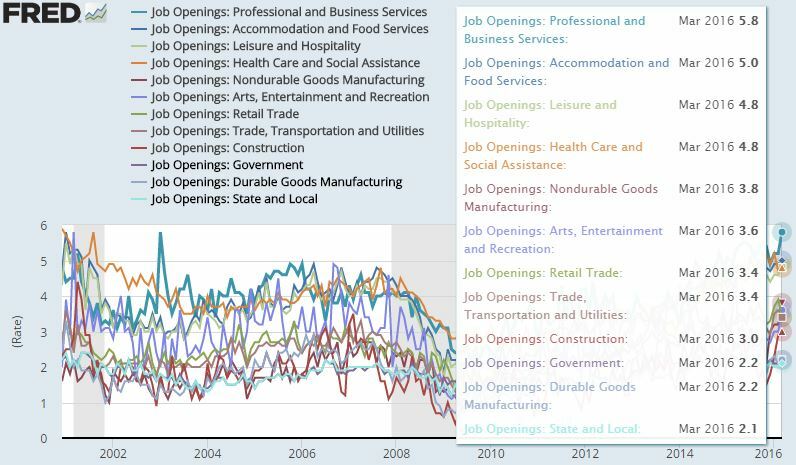 March JOLTS (Job Openings and Labor Turnover Survey) from the Bureau of Labor Statistics (BLS) indicated persisting job polarization in the U.S. labor market. Aggregate readings may suggest a case of labor skill mismatch: job vacancy rate rose to 3.9%, a level last seen in July 2015 and January 2001, while hire rate declined to 3.7% from 3.8%. Quit rate remained unchanged at 2.1%. Nevertheless, other structural trends appear to be more durable than that of skill mismatch. Details of the report indicated persisting job polarization with soft vacancy and hiring data in middle-skilled positions: labor turn-over in cognitive non-routine (professional and business services) and manual non-routine (leisure and hospitality) professions consistently outpaced cognitive routine (government and education) and manual routine (durable goods manufacturing) positions. Relative to the aggregate measure of 3.9%, vacancy rate in the higher-wage professional and business services sector achieved an impressive 5.8%. 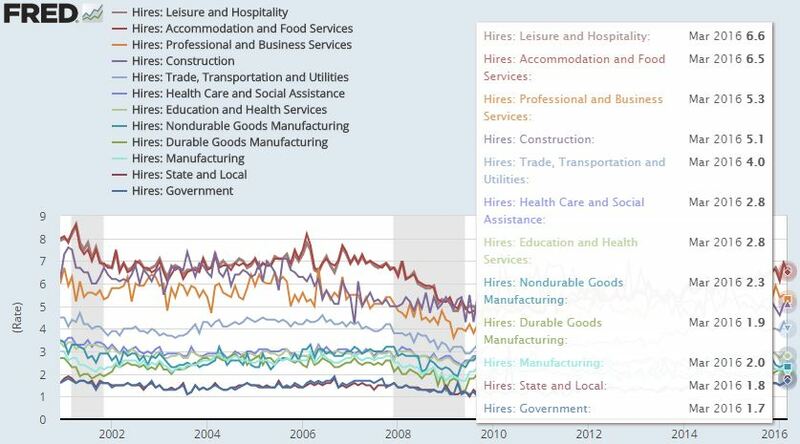 Low-wage service sector job vacancies (accommodation and food services plus leisure and hospitality sectors) are also plentiful, while soft readings in manufacturing, construction, and government jobs support the thesis of “hollowing out” of middle skill jobs. The skill mismatch thesis is more evident in the health care and social assistance sector (vacancy rate at 4.8% vs. hire rate of 2.8% and quit rate at 1.8%), while vacancy and hire rates in the professional and business services sector are closer to parity at 5.8% and 5.3%, respectively. In comparison, the rate of hiring in manual non-routine professions have outpaced job postings. 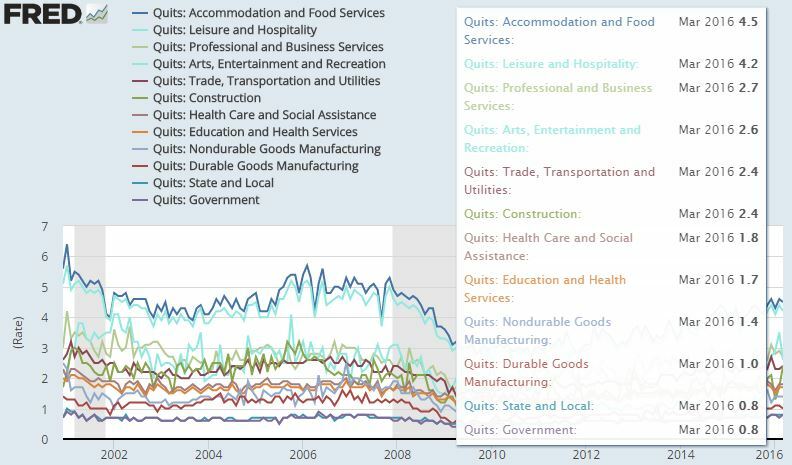 The apparent abundance of low-paying (and non-automated) service sector jobs also boosted the sector’s quit rate. Job polarization is an on-going source of structural unemployment and underemployment. By nature, accommodative monetary policies have limited efficacy on structural labor market weakness (such as job automation and demographic shifts). However, “post-liftoff” policy communications by Chair Yellen have rarely mentioned structural factors affecting the labor market. The most recent of speech that briefly covered this topic was in July 2015 – and subsequent comments by the Fed Chair had largely highlighted the cyclical nature of labor market slack. Another factor we consider when assessing labor market slack is the elevated number of workers who are employed in part-time jobs but would prefer to have full-time work–in other words, those classified as “part time for economic reasons.” At around 4-1/2 percent of employment, the share of such workers is notably larger than has been historically typical in a growing economy. Some portion of the greater share of workers who are part time for economic reasons may reflect structural rather than cyclical factors. For example, the ongoing shift in employment away from manufacturing and toward services, a sector which historically relied more heavily on part-time workers, may be boosting the share of part-time jobs. Despite these structural trends, which make it difficult to know where the share of those employed part time for economic reasons may settle in the longer run, I continue to think that it probably remains higher than it would be in a full-employment economy. One reason you’d want to let the economy run a little bit hot in terms of putting a little bit of pressure on the labor market is not just because that’s what you need to do to push inflation back to 2 percent but also because it will help to bring the long-term unemployed back into the labor force and give them opportunities. Uneven labor market growth is a drag on real wage growth. Since monetary policy tools resemble blunt instruments rather than a scalpel, policymakers’ desire to foster higher inflation via stronger labor market will result in further services inflation (rent, medical services, etc) and even more impressive readings in cognitive non-routine professions (sectors with high turn-overs continue to lead in payroll gains).